I attached an example that shows how to set the color based on the data value in a chart. I don't understand the question about grouping the city. If you choose your city column to be the X-axis category, the data will automatically be grouped by city. I haven't had a chance to look at your example, but I want to offer a quick suggestion. In beforeDrawDataPoint, dph.getSeriesValue() gets the name of the series being drawn and dph.getBaseValue() gets the name of the category. Add a "switch" statement or other conditional to set the fill based on one or both of those values. In the barColor.rptdesign example I posted earlier, beforeDrawDataPoint triggers 4 times (once for each bar on the chart). The dph.getSeriesValue() equals "Sales" each time, and the dph.getBaseValue() is "company A" the first time, "company B" the second, etc. PS: where would you know the color fill.set code from ? any chance to get some help on the code ? how and where can we get the fill.set ( ****. ****..x.x.x.x.x) // for the color for example what would be the fill.set () for purple ? There are several formats for specifying colors. The fill.set() function takes values from 0 to 255. Then you can add a series in the chart that does a sum of the computed column. As I said, I'm not sure this is what you are trying to do, but I hope it is helpful. If you want to change the bar colors dynamically based on the data value, use the code in the report that I posted earlier (barColor.rptdesign). 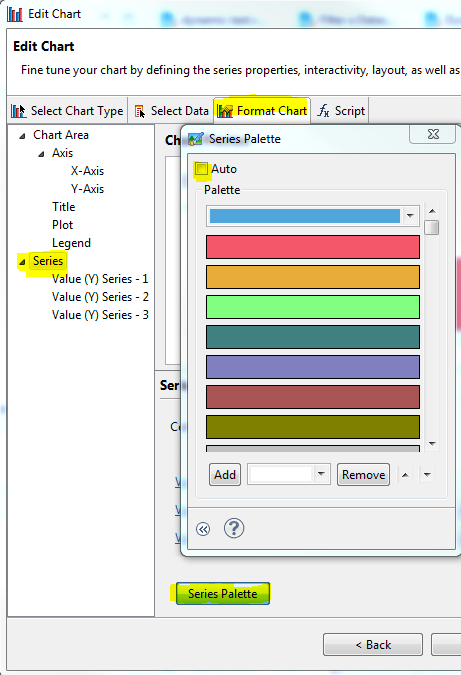 In my screenshot, clicking the top bar and selecting a color will set the color for Value (Y) Series -1 (as shown). The second bar will set the color for Value (Y) Series -2. The third bar will set the color for Value (Y) Series -3. I apologize if I am misunderstanding the question again. I hope the attached example is helpful.